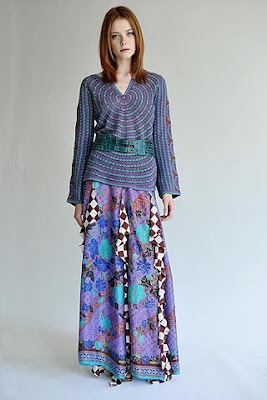 The Resort 2009 collections are full of awesome hijab-friendly outfits and ideas, from wide-leg trousers to kaftans and maxis. These are just a few from various designers that make great use of maxi skirts. Roberto Cavalli keeps things simple with a black skirt and blazer, and a bow-front blouse underneath. Lanvin used earth colours in chic fabrics for a more laid-back style, whilst Nicole Miller went for hippie-chic and chose to mix funky prints together. 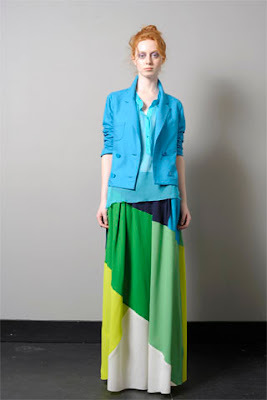 Chris Benz featured a fun colour-block skirt with a light blue jacket layered over a thin blouse. Just roll down the sleeves and add a scarf to any of these looks and you've got a hijab-ready outfit. Which look is your favourite? I love long skirts! they are the best ever! They look so modest. The only missing item is the hijab. Love all the skirts. Asalaam alaykum sis!.. I have a question. I always wear pants+longtops/shortdresses cause I think I'd look weird wearin maxi dresses or maxi skirts because I'm really short (5ft/1.50mts). Do you think I should go for maxi dresses or what? i am very inspired by you,i also would like to study medicine after college! I love the blue jacket with multi-colored skirt. Your blog is a real inspiration. May Allah reward you. I really love that blue over Green, yellow, white, and black! So pretty and elegant! Honestly, I'm mega short. Like 4'10. I'd love to wear skirts but it's such a HASSLE dealing with length and everything...plus they weigh me down. I guess I need reassurance lol. Being too short for a maxi seems to be a very common concern lol! I'm on the short side too, and actually, I find that maxi dresses (if you pick the right one) can make you appear taller. The key lies in the colour and cut. Choose either a plain coloured dress, or one that has a simple print that is consistent throughout the dress. With regards to cut, I'd say avoid tiered styles, or ones that are too volumious, it will only make you look wider and therefore shorter. When it comes to covering up the top half, choose something short like a shrug or cropped jacket, rather than a long cardigan. This will also help lengthen the silhouette. When it comes to skirts, it's pretty much the same idea; try matching the top to the skirt if it's plain, and avoid tiered cuts. For both skirts and dress , try to choose ones that are as long as possible, past the ankles. Anything shorter will just make you look small too. Hope that helps! Try it out and let me know what you think! wicked post Jana... loving the 1st and 2nd pics especially! Love this post...as i do all the posts! Your blog, Jana, is one of the first things in my Inbox, that i open when checking my emails. I can't wait to see what you're going to come up with next! So great that maxi skirts and dresses are 'in' this season. It gives us more choices. i'm not the best seamstress, so buying things off the rack is a treat. Lots of scarves in all the stores too! A good time for Muslimahs! Good advice about long skirts. I too find that the longer the better for making one look taller. so is 5'6 considered too short ? I think these skirts are stunning. I like the maxi dress trend as well. I have to wear really high heels for it to work for me though.